Yesterday morning I drove down to Massachusetts Avenue to lend a hand with a strawbale building raising. I've had a longtime interest in green construction techniques, and this seemed like a great opportunity to learn and stretch my underutilized grad student muscles. 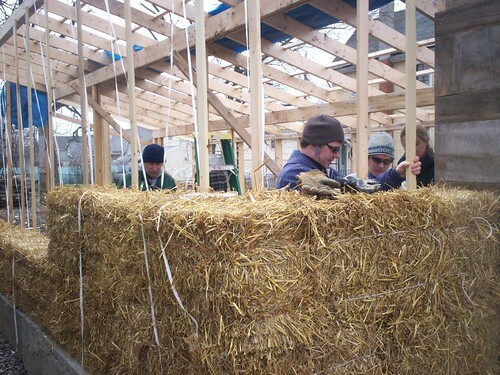 The project is a great example of broad community-based collaboration: local architect and UB professor Kevin Connors and his students contributed design and labor, strawbale construction expert David Lanfear provided his construction experience, while the Massachusetts Avenue Project provided the building site and general coordination. Approximately three dozen volunteers worked at the site throughout the day, mostly consisting of Kevin's students and friends of the builders. But there were several people, like me, who stopped by out of curiosity. When I arrived, the foundation and framing was completed (apparently the foundation was laid last semester). Lengths of hose and tubing were set into the foundation about a foot under the surface, and my first assigned task was to run nylon webbing through these tubes. This webbing would then be run over the top of the bale walls, and cinched down tightly to vertically compress the bales. Unfortunately, many of these tubes had filled with clay and mud in the intervening months, and it took several hours to clear them all and run the webbing through. After lunch, courses of bales were stacked and tied to the wooden frame. 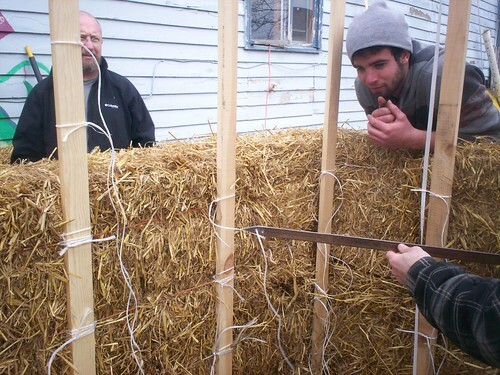 Two long pointed "needles" were threaded with baling twine, punched through the bales, then secured back to the frame. This is a lengthy process, at least for us greenhorn builders, and we had only finished three courses of bales by 5:00pm that evening. The existing schedule states that the walls will be plastered next weekend, but it looks like that deadline might slip a bit. There is a lot of negativity and pessimism in Western New York. It's incredibly refreshing to spend time with enthusiastic people who are working hard to make a difference in their community.